I am a pillow lover.It goes along with my obsession of lampshades and tea towels.I thought you would love how to paint your own stenciled linen pillows too! 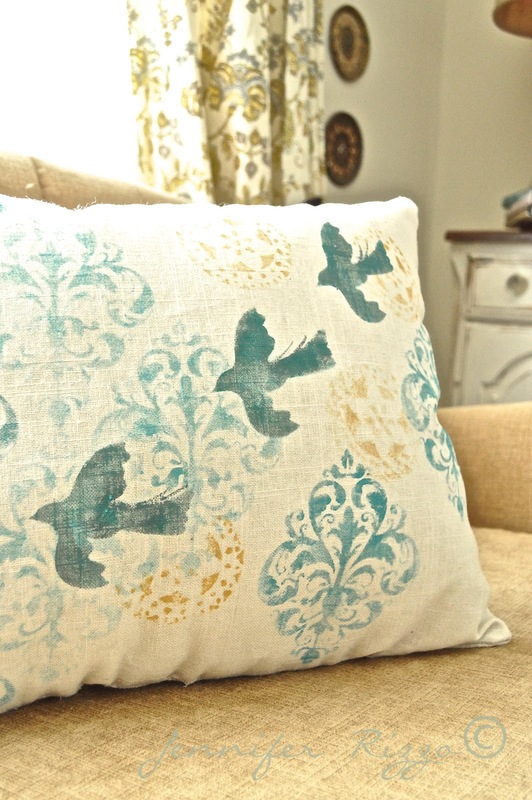 I love making my own pillows with stencils because it is a nice way to get a custom look with out spending a lot. I also love making my own stencils. I used to do it all of the time when I was doing hand painted furniture. I like to use this kind of textile ink. 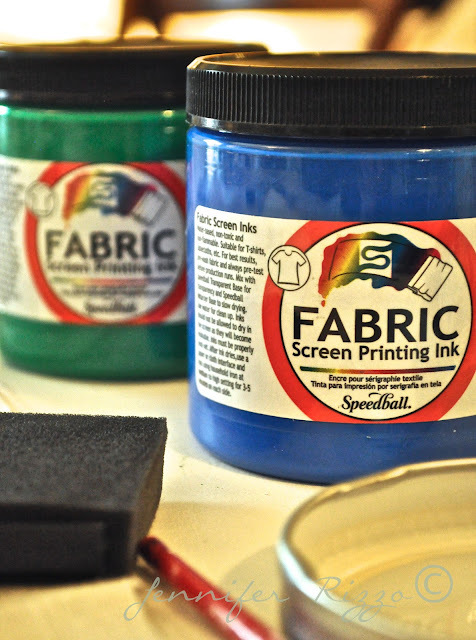 It’s for screen printing, but I use it for all kinds of fabric crafts all of the time. By volume it’s cheaper than fabric paint, it’s a bit thicker (You can thin it with water if you want. ), and lasts much longer. After it’s heat set it’s very colorfast. It’s also non-toxic. I buy mine when they are on sale or with a 40% off coupon at the craft stores. There aren’t as many color choices as fabric paint, but they have all of the primaries,secondary’s and black and white, so you can mix your own colors. I save old jelly jars and pickle jars to keep the custom paint colors in. You an also use fabric paint with this project. It’s all personal preference. I just prefer screen printing ink. I like to use a foam craft dauber to get the right amount of ink. I just lay my craft stencil down and pounce away. I’ll use painter’s tape to tape it down if I want to make sure it doesn’t move. I just overlay my stencils and try different pressures to get different looks. Anything can be a stencil . This bird cut-out is from a Christmas card! I also used a doily stencil too. Sometimes I like to use letter or number stencils like I did on this tray project. After my ink dries, I heat set it,sew my pillow and stuff it. It’s a great way to get those custom colors or images you just can’t find in the store, and there are so many stencils you can choose from. Where did you get the paint? Your pillow is wonderful. Beautiful! Love the color and design. I love your stenciled pillow. Your pillow is beautiful. 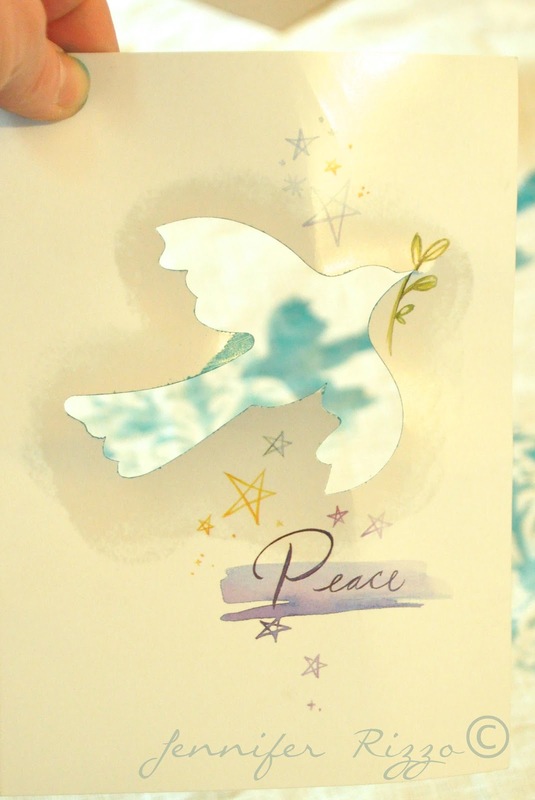 Very creative to use old Christmas cards as stencils. 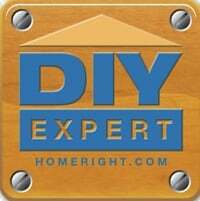 I live close to you in Carpentersville, IL. What a great project since we are in the middle of a snow storm right now. When you say you heat set the pillow is that just running a hot iron over it after its done? 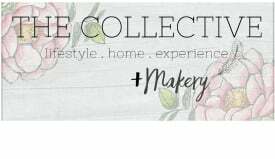 I hope I can meet you one day your blog is such a inspiration. It is fabulous and very Anthro. Thanks for all the fabric paint tips. I’m going to have to try those screen paint. Very creative ideas to make stencils from!!! Beautiful! Love the colors and shapes!! Thanks for sharing your tutorial! Have a blessed week! I really like how that turned out! Beautiful! This pillow is wonderful, Jen! I adore the the color combo. The pillow is beautiful. I love the design and colors so pretty. I love the colors you used, so fun and perfect for spring! gorgeous! you make this look way too easy! Love the outcome. I, too, am a lover/hoarder of pillows. Love the colors and design you used on this pillow. So pretty!! Beautiful Jen! LOVE this technique even I can do this ;-). Your pillow is so pretty!Love the colors you chose too! That’s so pretty. I have a pillow obsession too and so does my daughter. She is teaching herself to sew and has made two pillows. This is something she could try. This is Beautiful! !The color combination is Lovely! Absolutely gorgeous! Thanks for the tips! I have never liked any stenciled fabric- it always looks, well, stenciled. This, however, is GORGEOUS!!!!! I’m dying to do some now. I cannot begin to say how much I like it! Thank you! love the color combo. Featuring in my weekly wow’s on Saturday! Jen, I, too, am a great believer in screen print paid, namely Speedball. 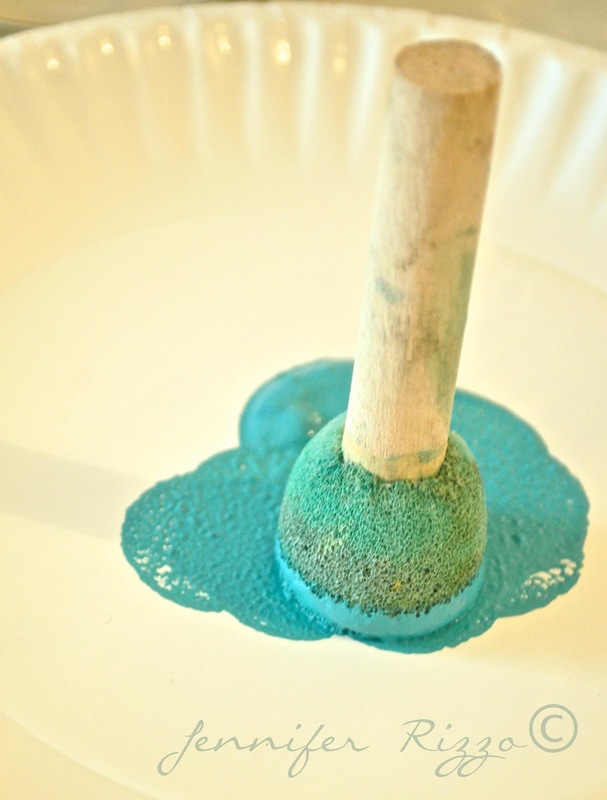 You just cannot beat it for vivid and lasting color, as I attest to on my blog “Mimi Mine.” Your bird pillow is great. What a good idea to use a Christmas card for a stencil! That should have been screen print “paint” in my previous comment. So much for my keyboarding expertise. Stunning! I love the texture you get by not filling in the stencil fully. Just found you through Savvy Southern Style and I’m now following. What a great pillow. I love that you stenciled it. I would love for you to come and link this up to my Winter Blues Wednesday party going on right now (if you haven’t already). Hope to see you there. Found you from savvysouthernstyle. I’m a big-time linen-ohlic. Must say that I particularly like the colors and patterns you chose for this pillow (and appreciate the tip about screen printing ink). Lovely and, best of all, uniquely yours. That pillow is so gorgeous!! I love how you stenciled it. I need to go buy some screen printing ink. i would love to know where to get a stencil just like the Fleur De Lis stencil u used. ur work is beatiful! for pillows for my newly painted décor and these are perfect!